It’s time for you to become a padawan. For years, you’ve hoped and waited for this day. 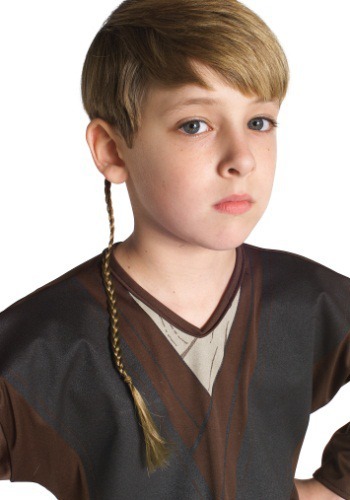 There’s only one problem—you don’t have enough hair to make the iconic padawan braid. You could do what other hairless species do when they become padawans—creating braids out of things like beads and silk—or you could snap on this handy Star Wars Jedi Padawan Braid. The braid is 20-inches long and easily clips into hair with the included plastic clip. No one will be able to tell the difference. There’s no shame in it; even Obi-Wan and Anakin used extensions during the first movies, since it takes so long to grow hair out. You’ll just be following in the footsteps of great Jedi knights before you… well, except for Anakin. It’s probably best not to follow in his footsteps, what with the mental breakdown and turn to the Dark Side and almost destroying pretty much the whole universe. Please don’t do that.